Friden EC-132 in use showing 4 lines of a calculation on the cathode ray tube (television-like) display. Ten-key electronic desktop calculator with square root. Uses a crt (Cathode Ray Tube) to display the contents of the four registers. 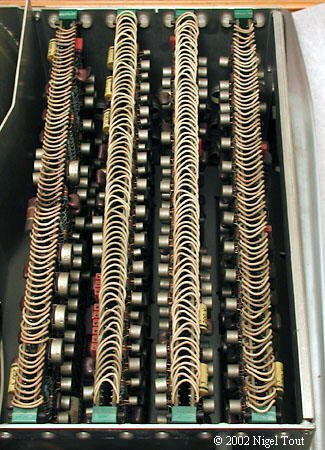 The EC-130 (without square root) was one of the first all-transistor electronics calculators, in 1964. Capabilities - 4 functions, memory, square root. Display - 4 lines of 12 characters each, using cathode ray tube, see below. Size - 460 mm x 600 mm x 260 mm (18" x 24" x 10"). Weight - 19 Kg (42 lbs). Technology - 8 boards with individual transistors (mainly 2N1304 (NPN) & 2N1305 (PNP) alloy-junction Germanium transistors, & 2N2635 transistors) on 8 boards 290 mm x 170 mm (11.5" x 7"), and delay line memory. Made in the USA about 1965-68. 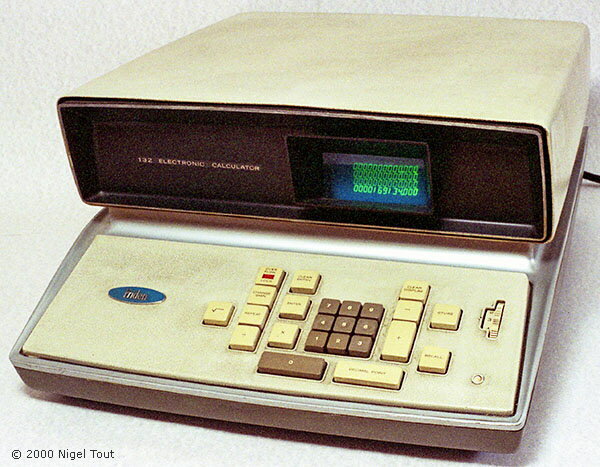 The Friden EC-130, introduced in 1964, is a contender (together with the IME 84 and the Sharp CS10A) for the accolade of the first all-transistorised desktop calculator. The EC-132 model was introduced in 1965 and additionally has the square-root function. In January 1966 a substantial price reduction was announced in Britain ("of over 20%"), to £690 [about $1900] for the EC-130 and £810 [about $2250] for the EC-132 (nearly the average annual wage at that time). The calculator uses Reverse Polish Notation (RPN), so there is no "=" key. 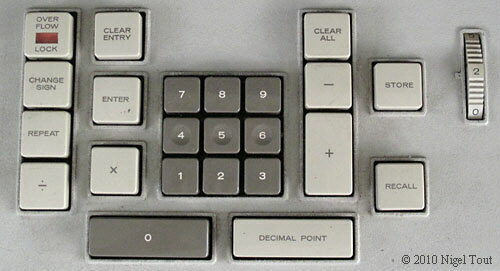 With this method of operation (used by Hewlett-Packard calculators and some others) the first number is keyed in and then the "Enter" key is pressed. The second number is keyed in and then the operator ("+, -, X, /") is pressed and the calculation is performed. The decimal point key has "Decimal Point" spelled out. The "Repeat" key repeats the entry of the last number. The switch at top right for manually setting the position of the decimal point. As with most early calculators there is no automatic floating decimal point. Friden EC-130, which is similar to the EC-132 but lacks the square-root function. Photographed at the National Museum of Computing, at Bletchley Park. The keyboard of the EC-130 lacks the square-root key. The EC-130 and EC-132 have four Registers formed into a Stack. The display shows the contents of the registers, with Register #1 at the bottom and Register #4 at the top. Numbers are keyed into Register #1 and so appear on the bottom line. When "Enter" is pressed the contents of each register are transfered to the next register. The standard four-function operations are performed on the operands in Registers #2 and #1. For example, at above left 22.0 has been keyed in and "Enter" has been pressed. Then 7.0 has been keyed in. Above right shows the result when the Divide key is pressed and the answer 3.14285 (approximation to PI) is obtained in Register #1 and the contents of the other registers are transferred to the previous register. Registers #3 and #4 are used for the storage of intermediate answers, though numbers in Register #4 also act as constants. 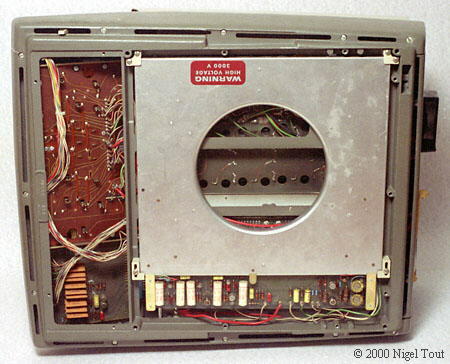 Inside from the top, showing the 8 circuit boards (in 4 wired together pairs) for the calculating logic, and the cathode ray tube. The 8 circuit boards of the EC-132, each with several dozens of transistors in metal cans. The boards are mounted in pairs and are connected together along the top edge with wire jumpers. Inside from underneath, showing the casing of the delay-line memory. Click here to go to the page describing delay line memories. Bruce Flamm has a fascinating article on the Friden EC-130/132 in the Collecting Calculators section of this site. 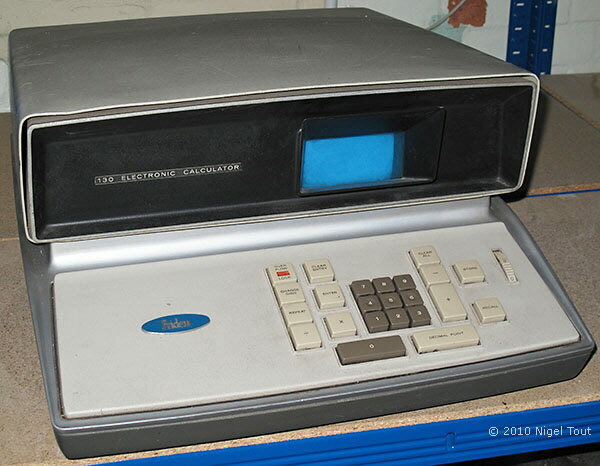 It has an interview with Nicholas Bodley, one of the original eight technicians to be trained at the Friden factory to service this amazing fully-electronic calculator, and includes technical information about its operation. For further technical information visit Rick Bensene's excellent site - the Friden EC-130 at https://www.oldcalculatormuseum.com/friden130.html and the Friden EC-132 at https://www.oldcalculatormuseum.com/friden132.html. Youtube video showing the internal components and operation of the Friden EC-132 at https://www.youtube.com/watch?v=2BIx2x-Q2fE. Youtube video showing the operation of the Friden EC-132 at https://www.youtube.com/watch?v=hb9mogNCoWQ. The photograph alongside illustrates the pace of electronic development. Singer took over Friden in the 1960s. 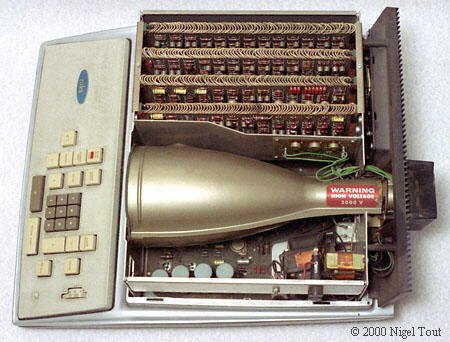 Less than 10 years after the EC132 shown above the calculators had shrunk to pocket size (though this one is without the sqaure-root but does have a memory) and a fraction of the cost through the use of Large-Scale Integrated Circuits. The Singer Friden 1234 shown alongside is only 75 mm x 101 mm x 28 mm (3" x 4" x 1.25").